(Newser) – It's called Dsuvia, and the potency of this opioid is hard to fathom: It's up to 1,000 times stronger than morphine and up to 10 times stronger than fentanyl, reports USA Today. 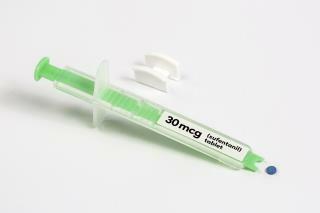 Despite the worries of critics that it will add to the nation's opioid problem, the painkiller from AcelRx won FDA approval on Friday, per the AP. The big selling point of Dsuvia—which contains the painkiller sufentanil—is that it can be given to patients easily in place of an IV. The Pentagon, in particular, likes that option for soldiers on the battlefield. "Dsuvia will be tightly controlled" BAAAAAHAHAHAHAHAHA But hell, look on the bright side... great tool for population control. kill people needlessly, but enrich many others. The Chinese underground labs are cheering. It'll be on the streets in no time. Definitely not putting that genie back in the bottle.